Mountain bicycles are popular with the young, or young at heart, that enjoy riding off of the beaten path. They are designed to withstand the demands of riding on rough terrain where a more cushioned ride, better traction, and high ground clearance are critical. Since the handlebars are raised the riding position is much more upright than a road bike which enhances viability, and control. They use 26" knobby tires for better traction and help to soften the ride as well as saddles thet are wider and softer than a road bike. Mountain bikes are available as a hardtail ( no suspension) with front suspension only, or with dual suspension (front and rear) The suspension enables an experienced rider to ride on extremely rough terain that no other bike could handle. It helps to cushion the ride and keep the rider in control. Mountain bicycle frames are made from several different materials ranging from cro-moly (a steel alloy), aluminum, carbon, or titanium with the titanium being the most expensive but also the lightest and strongest and aluminum being by far the most common. The gearing on these bikes cover a very wide range (up to 27) to accommodate all of the different terrains and enable steep climbs. 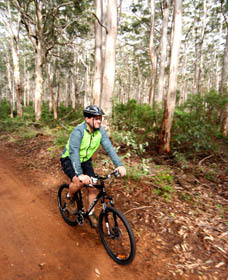 In choosing a mountain bike there are several options to consider depending on how and where you plan to ride. If you are just planing on some trail, or single track riding, a hardtail may be fine. But, if you are going to do some downhill riding, or even off road, you will likely want front suspension or even dual suspension and heavier duty or disc brakes. 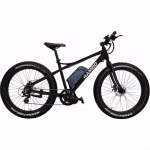 To add even more versatility there are now folding mountain bikes available that are rugged enough to handle serious off-road cycling. And thay can often be transported without the need of a bicycle rack. Not too long ago people were buying these bikes just to get the fat tires, that they couldn't get on a road bike, but there are much better options if this is all that you are looking for like a comfort or a cruiser bike. There is a whole new generation of bikes known as "fat tire bikes" that satisfy the desire for a cushioned ride and often can be used in lieu of suspension. They are usually less expensive then bikes with suspension and more maintenance free . A fat tire bike typically has 3" to 4" wide tires for a more cushioned ride but is a bit harder to pedal than a cruiser. Even so the ride is often worth the trade-off. They are gaining rapidly in popularity. Getting a full suspension mountain bike, or even a hardtail, for a casual ride in the park is like getting a Hummer to drive to church so it may pay to take a close look at fat tire bicycles choose wisely.